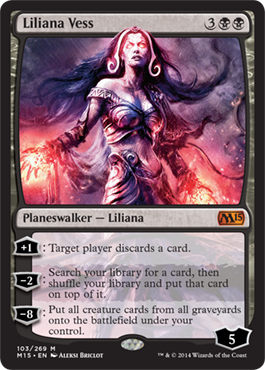 So, first of all, Liliana Vess has been in Lorwyn, M10, M11, the Garruk vs. Liliana Duel Deck, and then she went along with one of the Duels of the Planeswalkers. Now we have her back. She pairs with Waste Not pretty well due to her +1 ability. Her -2 is pretty cool and useful to find specific things. And lastly, her -8 is powerful. She also has 5 loyalty when she comes in which makes her strong. So now you've seen three of the four Planeswalkers. Who is left today? 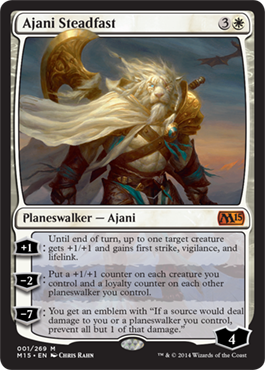 That's right, a new Ajani! This is the fifth version of Ajani and the third legal in Standard when M15 comes out until September 26th. And he is strong. Not only does he come in with 4 loyalty for four mana, but his +1 gives just one creature +1/+1, first strike, vigilance, and lifelink which is powerful. It somewhat helps him given that there will be at least one creature untapped for blocking on your opponent's turn. His -2 puts counters everywhere. He puts +1/+1 counters on all your creatures and also puts additional loyalty counters on other Planeswalkers. That's right, he can boost others (he can't put another counter on himself with the -2 ability) which can be strong in a Super Friends deck. His -7 is okay, but also cool. We finally get an Ajani emblem and it permanently reduces all damage sources to 1. So if an opponent swings in with a 3/3, a 4/4, and a 5/5 and you decide not to block any of it, you're only taking three damage. The awesome thing is that this also counts for Planeswalkers too. A new Avacyn? 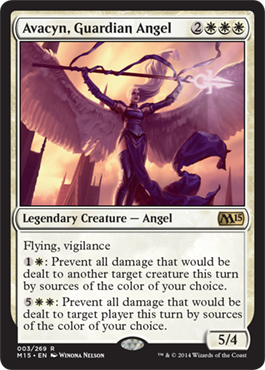 Sounds cool... For 5 mana (three of which contributes to white devotion, by the way...), you get a 5/4 with flying and vigilance. Already powerful, but then we have the first ability which prevents damage dealt to one of your creatures by a particular color this turn. THEN the other ability prevents all damage from sources of a particular color dealt to a player. That ability may be a bit over costed, but hey, this is awesome! 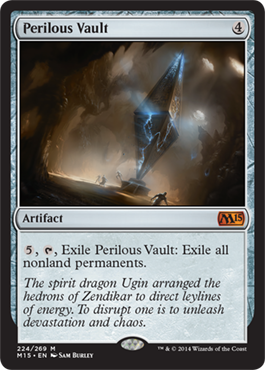 Perilous Vault, a card that represents the Zendikar tie-in with Khans of Tarkir (Sarkhan was last seen on Zendikar, and his new art shows that he kept bits of hedron and such, so it could be story relevant) is a four mana artifact that acts like Oblivion Stone, but instead it exiles everything that isn't land for five mana. This is super powerful removal and I laready know where I would put this. I would mainboard a couple of these in any kind of burn deck to wipe out my opponent's board. Seems really useful. It could also destroy Hexproof decks like Bogles, although you'd need serious mana ramp in Modern just to get there. I'm loving M15 so far, and I hope all of you are too. Be sure to check up on our spoiler page for anything you've missed.